We've finally reached the last location of my two month long summer trip which started way back in July, and that's Bali. 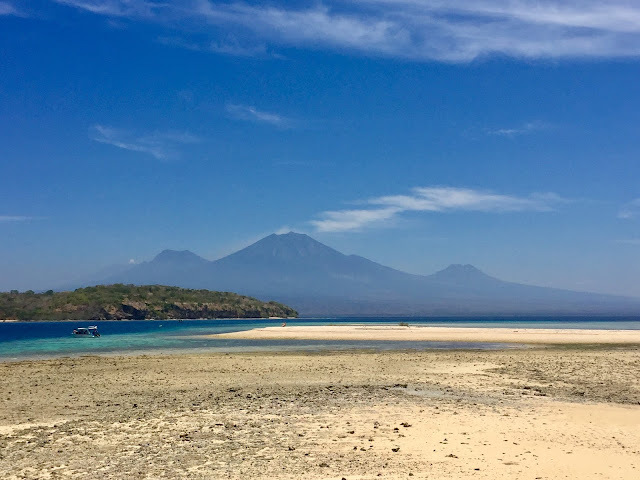 My tour through Indonesia had already covered Java over the last week and a half, and now there were a few days in Bali before it ended, followed by a couple of extra days there by myself, giving me a total of a week spent there. We crossed from Java on the ferry, arriving at the port at Gilimanuk, and then taking a bus transfer to our hotel. Bali's traffic can be pretty hectic at times, with lots of narrow roads and not many alternative routes available, but the north west region that we arrived in wasn't too bad; it's around Ubud and Denpasar where you can be grid-locked for hours at a time. 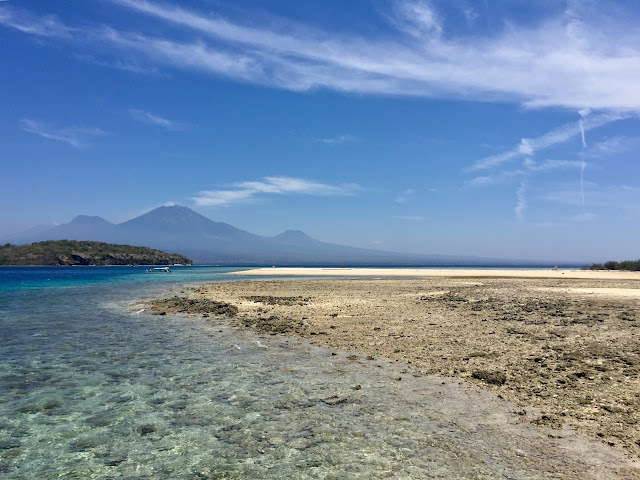 We were spending our first couple of nights in Pemuteran, on the north west coast, and were greeted at our hotel (Kubuku Ecolodge), with frangipani flowers, welcome drinks, and our names spelled on our beds with flower petals, much to our delight. We arrived in the early afternoon, so we had some lunch at the hotel first and were introduced to some of the staff there, as the hotel uses some of its profits to fund education for local students, who also work there, which I thought was a great initiative. We had some time to settle in to our rooms too, but not for long, as my roommate and I were very eager to check out the beach. The hotel was set back from the main road, and the beach was on the other side, but it only took about ten minutes to walk there. The sand was black from the volcanoes on the island, and I haven't been to many black sand beaches before, so it was an interesting change, and no less beautiful than white sand (which can be found elsewhere on Bali too). One of the things I noticed throughout my time in Indonesia, and especially on Bali since it's so popular with tourists, is that the beaches were very clean and well maintained, which was so nice to see after some of the polluted areas in the most overcrowded parts of southern Thailand. Pemuteran's beach was mid-sized, and while there were other tourists around, and hotels on the beach front, it didn't feel too busy. We spent a little while taking some photos first, then went for a dip in the bright blue waters, while boats bobbed along in the background. We lay out in the sun for a while too - although guess which idiot forgot a towel, whoops! - before wandering back towards the hotel. We ate dinner in the hotel that night, at tables which had been moved from the restaurant area around to the bar and pool, as our dinner came with a show that evening. Some children from the local village performed songs for us, playing guitar, drums, recorder, and singing. They played traditional Balinese music, as well as some Western pop songs. There was also a dance performance, one from a young girl and another from an older one, wearing traditional costumes to do so. It was nice to get a look at local culture and traditions, especially from local children, all while enjoying a lovely meal. After dinner, we ventured through a side passage out of the hotel grounds, to the house where our tour leader, Gede, and his family live, which came as quite a surprise to us when we learned this! It was nice of him to invite us into his home though, and we sat on the front porch, drinking home-brewed palm wine. Our entertainment continued too, when my roommate and the tour leader from the other group staying in the hotel began singing and playing guitar, jamming out whatever songs they both knew. It was a very chilled, and very enjoyable way to spend the evening - so much so, that we did it again the following night! The next morning, I woke up bright and early-ish, to head out on my activity for the day. The hotel offered various choices to book, as well as spa treatments (which my roommate was going for), and I had chosen the snorkelling trip. 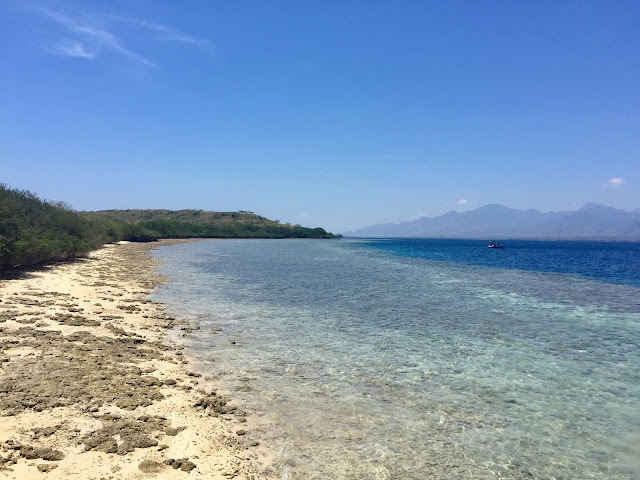 I've been snorkelling many times before, and did go back and forth for a while before deciding, but Pemuteran is near Bali Barat National Park, which includes part of the ocean, and that's where our trip would take us. 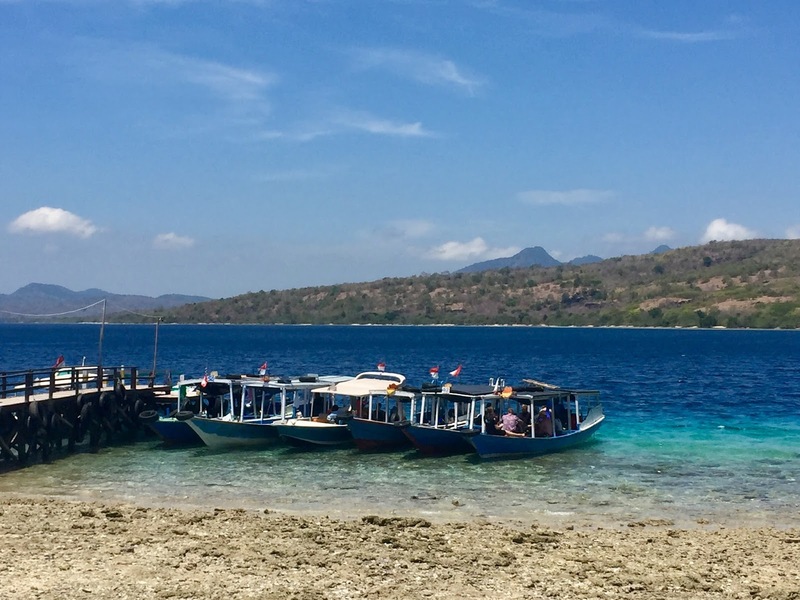 We drove west again, having already been fitted with our gear at the shop, and then embarked our boat to head towards Menjangan Island. 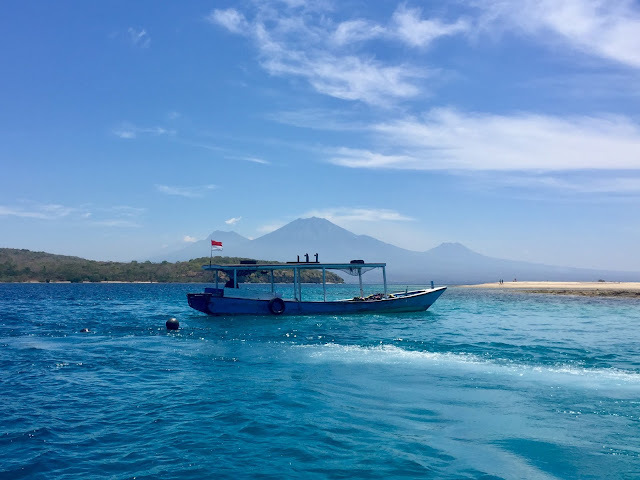 It took almost an hour to get to the island, but when you're cruising across clear waters, under a blue, sunny sky, with the volcanoes on Java visible on the horizon, I certainly wasn't complaining. I don't have an underwater camera or anything, so all my photos were taken from the boat, and it was a very beautiful location above the water, as well as below. I've been snorkelling in several parts of Asia - Vietnam, Thailand, and the Philippines, but my best snorkelling trip has still in Belize a few years ago. However, Bali is probably in second place now for me, as the reef here was much more intact and well preserved than some others I've been to. We had two guides with us in the water, and at the first location we swam along the reef that borders the island, and then back again on ourselves, so the reef was always on one side, and open water on the other, where the ocean floor was barely visible. There were so many species of fish there, I couldn't even begin to learn all their names, so there was always something to catch your eye, and we swam at a good pace, not too fast or slow, to take it all in. The highlight was on the way back to the boat, when one of the guides stopped to point out a sea turtle, which you're not always guaranteed to see, so I was delighted and we stopped to watch it for a while. 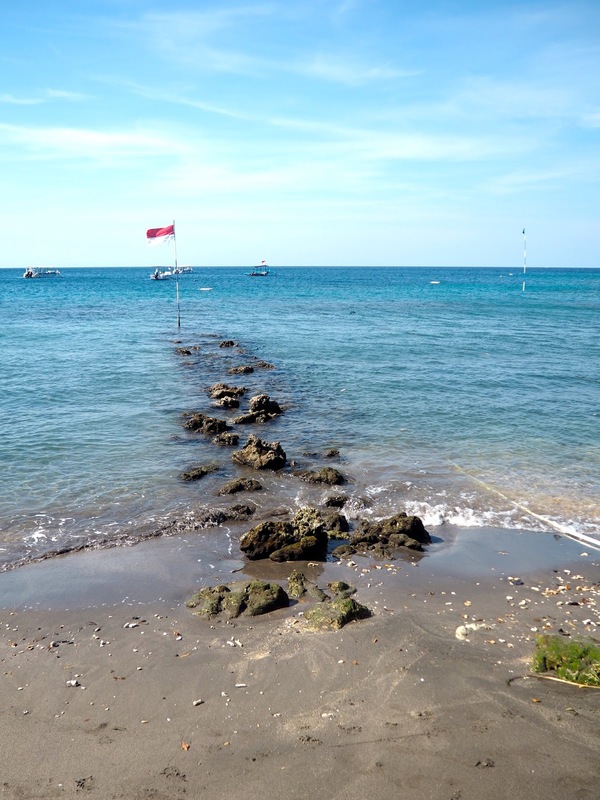 We came ashore on the island, taking care to avoid the sea urchins in the shallows as we made our way out the water, then stayed on the beach to have lunch. It was provided by the dive company, and there were a variety of seating areas on the sand to lounge at as we ate, though we mostly stuck to the shady ones because of the strong midday sun. Beside us was a huge expanse of white sand, the volcanoes still visible in the distance, so it was a very scenic spot to enjoy lunch. We returned to the boat and sailed further around the island to our second swimming location, where we swam in only one direction this time, and the boat picked us up at the other end of this stretch of reef. The water around us was even deeper this time, as the bottom was completely out of sight, and only the beams of sunlight streaming down gave an indication of how far down it went. The water is crystal clear though, and it was so easy to see everything the reef had on offer. There were no turtles this time, but more than enough different varieties of fish to make up for it. There were currents of warm and cold water though, which made me want to linger in the warm ones and speed up through the cold, but overall, it was a lovely morning's outing. We returned to the boat at our pick-up point, and returned to shore and eventually the hotel. I definitely caught the sun on my back that morning, being face down in the water for so long, but fortunately I'm tanned enough from travelling for so long that I just went a darker brown instead of red! Back at the hotel, I spent the afternoon by the pool, meeting up with my roommate there again - her day had included a massage and pedicure at the spa, and a visit to the turtle sanctuary down by the beach, so there are various options to suit everyone in Pemuteran. We had some happy hour priced cocktails and took a dip in the pool to cool off, as the sun was very, very hot - the north side of Bali is hotter than the south, being closer to the equator (this was my first trip to the southern hemisphere!). That evening, we had dinner at the hotel again, followed by another music session at Gede's house, and later my roommate and I went out in the village to watch some locals playing football, along with some members of the other group. 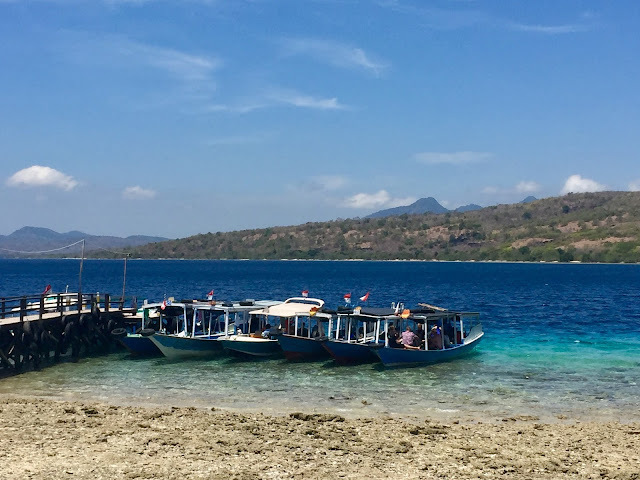 We had to depart Pemuteran the following morning, to head to other locations in Bali, but I could have quite easily stayed for longer. Even doing activities like snorkelling, it was a so relaxing, and to be in such a beautiful corner of the world was just idyllic!